Customers have the freedom to choose the travel dates. Cleartrip promo code for international flights has to be provided before making the payment. Cleartrip in collaboration with SpiceJet is offering domestic and international flights at amazingly low price. Domestic one-way base airfare starts at Rs.826 and international one-way base airfare starts at Rs.3026. Open the Cleartrip application. Choose to make domestic or international flight booking. Enter the required details. Click on the search flights option to obtain the available options. Select the SpiceJet airlines and make the booking. Browse for the Cleartrip one way flight coupons available here and use them at checkout.Like Cleartrip, Yatra also offering various discount deals on flight tickets.To grab those discounts check Yatra Flight Coupons and save more on every trip. The discount is available only on one-way fares. The offer cannot be used along with other cashback deals. This is not valid for group bookings and it is valid only for selected flights. The offer is provided on first come first serve basis for a limited number of customers depending on the availability of flight seats. Cleartrip is offering a cashback of Rs.400 on domestic flight bookings. The cashback amount will be credited to your Cleartrip wallet.Open the Cleartrip mobile application. Choose to make a domestic flight booking. Enter the details such as departure and destination location, one way or round trip, travel date, the return journey date and the number of adults, children and infants traveling. Click on the search flights button to get the available options. Pick the flight of your choice and make the booking. Give the Cleartrip coupon code for domestic flights FLYHIGH. Still if you’re looking for more discount check MakeMyTrip Domestic Flight Offers and get more cashback. Make the payment. The cashback amount will be credited to your Cleartrip wallet within 24 hours of making the booking. The money credited to the Cleartrip wallet has a validity of 90 days. The cashback is valid only on domestic flights. Each user can use the Cleartrip domestic flight discount coupons only once. The offer is valid only for adults and children bookings and it cannot be used along with other cashback offers on Cleartrip. It is also not valid on payments made through net banking or cash. 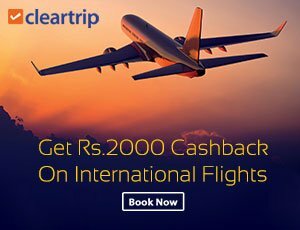 Cleartrip is offering a cashback of Rs.2000 on international flight bookings. Customers are open to choose any airlines of their choice. Open your Cleartrip account. Choose to make an international flight booking. Choose to make round trip or one-way flight booking. Enter the details such as destination and departure locations, date of travel, the date of the return journey for round trip booking, and the number of adults, children, and infants traveling. Click on the search flights button to get the list of available options. Pick the flight that best suits your requirements. Make the booking. Enter the Cleartrip international flight coupon code INTLTRVL to avail the cashback offer. If you want more cashback offers for international flights you can simply check Goibibo International Flight Coupons and get more. The cashback amount is calculated depending on the booking value. The offer is not valid on net banking transactions. The offer is valid only for payments made through credit or debit card. Each user can avail the Cleartrip international flight offers for three times during the offer period. The offer is valid on adult and child bookings only and not applicable on infants bookings. The offer cannot be used with other cashback offers. Cleartrip reserves the right to change the offer terms and conditions any time. Cleartrip in collaboration with Jet Airways is offering a discount of 30% on premiere flight bookings and 5% discount on economy flight bookings. Login to your Cleartrip account. Choose to make an international flight booking. Enter the required details. Choose to make a booking with Jet Airways. Make the payment. No coupon code is required to provide as discounted prices are displayed at the site. The discount is available only on return journey airfares. The offer is valid only on round trips. Cleartrip reserves the right to cancel the offer anytime. Pros: Exciting Discount Offers on Every Ticket Booking. Open the Cleartrip mobile application. Choose to make a hotel booking. Enter the details such as check-in and check-out dates, city, and the number of rooms required. Click on the search hotels button to get the list of hotels. Cleartrip provides booking facilities for all categories of hotels, budget as well as luxury hotels. You can now get 25% cashback on hotel bookings with the Cleartrip hotel booking offer. Pick the hotel of your choice tagged with the message “25% cashback credited in your wallet”. Make the booking. Enter the Cleartrip domestic hotel coupon code HOTELCT to avail the cashback. The cashback will be credited to your Cleartrip wallet within an hour of completing the transaction.You can find these type of discount offers in Oyo Rooms also. They also giving huge discounts on hotel bookings. The cashback amount credited into your wallet can be checked at the wallet section of your Cleartrip account page. This is valid only on domestic budget hotels. The transaction value has to be less than Rs.1000 to get the cashback. The cashback amount credited to the Cleartrip wallet can be used for other transactions at Cleartrip. The cashback amount added to the wallet expires in 90 days from the date of credit. The cashback is calculated on per transaction basis. It cannot be used along with other promotional offers at Cleartrip. Enjoy a family vacation at destinations of your choice at discounted price. Cleartrip is offering 55% cashback on domestic hotel bookings at some of the premium hotels in India. Open the Cleartrip application. Choose to make a domestic hotel booking. Enter the city, check-in and check-out dates and the number of rooms required. Click on the search hotels button to obtain the list of available options. Pick the hotel of your choice and make the booking. Enter the Cleartrip promo code hotel HTDEALS to obtain the cashback into your wallet.If you want more offers for domestic hotels then simply check Hotels.com Domestic hotels Coupons and save more. Make the payment. This is valid only on selected premium hotels in India. The cashback credited to the wallet has a validity of 90 days from the date of credit. If the customer cancels the booking, the cashback amount will also be canceled and the customer has to pay the cancellation fees for canceling the hotel booking. The cashback amount will be credited to your wallet instantly after processing of the transaction. Each user can avail the offer only once. It is valid for payments made through credit or debit card or net banking. The Cleartrip application is easy to use. Searching for the desired flight, hotel or holiday package is easy and you will hardly be disappointed. It provides a wide variety of choices at best prices. Apart from the train reservation services, Cleartrip also provides information about train schedules, PNR status and information about waiting list or RAC reservation for the chosen train. AgentBox operated by Cleartrip provides travel booking services for travel agents and travel companies. It provides commissions for the travel agents for making the reservations. If you are new to Cleartrip download the application and register at Cleartrip. The app is free to download for Google Play Store, Appstore and Windows. Choose to make round trip flight booking. Cleartrip mobile application lets you plan your travel on the go. Book a roundtrip flight using the Cleartrip app and get a cashback of Rs.2000 and also an activity worth Rs.250. Enter the required details such as departure and destination locations, date of travel, and the number of adults, children, and infants traveling. Enter the coupon code MYAPP. Make the booking. Choose to make payment using credit or debit card. The cashback amount will be credited to the wallet. An email with the coupon code to avail the Rs.250 activity will be sent to the registered email ID within one hour of processing the transaction. The offer is valid only for bookings made using the Cleartrip application. Each user can use the offer once on domestic flight booking and once on international flight booking. It is not valid on payments made through net banking. It is valid only for adults and children bookings and not applicable for infant booking. Finally, it cannot be used with other cashback offers at Cleartrip. Cleartrip provides a wide variety of services making it the best among online travel reservation applications. The real-time airfare tracker provides periodic fare alerts. Customers can complete the entire booking process in one-touch using the Expressway booking service. The passbook support feature allows paperless ticket reservation. It provides a list of last-minute deals giving an opportunity for the customers to avail them. 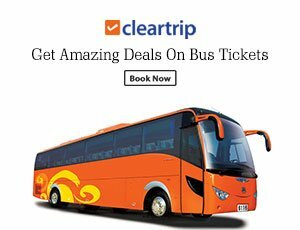 Customers are given the flexibility to book the bus tickets with Cleartrip. Another attractive feature provided by Cleartrip is that travelers can change their itineraries online easily. All the products are available at discounted prices. You can get this type of cashback offers in Abhibus also. To get those offers check Abhibus Coupons and save more. Cleartrip coupons help travelers save on their flight or bus reservations. It sends emails to the customers about Cleartrip latest coupons and deals. The company has won many awards such as Product of the Year, India’s Favorite travel website, Best app, Mobile Mover of the year and others. Travelers prefer Cleartrip not only for its best services but also for ease of the payment process. It provides multiple payment options such as credit or debit card or net banking or by use of third party payment gateways. All transactions with Cleartrip are simple, secure and fast. Login to your Cleartrip account. Choose to make international hotel or domestic flight booking. Enter the required details. Pick the best flight or hotel that best suits your requirement. Book your international flight or hotel at Cleartrip with MasterCard or Maestro and get a cashback of up to Rs.10000. Give the Cleartrip international hotel coupon code CTINTMC. Make the booking. Choose to make payment using your MasterCard. The cashback amount will be deducted from the total booking amount. Make the payment. This is valid only on payments made using MasterCard. Each user can avail the offer thrice on international flights and thrice on international hotel bookings. This is invalid on infant bookings and it cannot be used along with other cashback offers at Cleartrip. 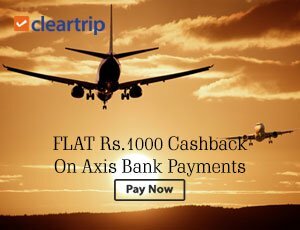 Cleartrip is offering an instant cashback of Rs.1000 on flight and hotel bookings for Axis Bank customers. Open the Cleartrip app. If you are new to Cleartrip download the app from App store, Google Play store or Windows Phone Store for free. Register at Cleartrip.com website. Choose to make flight or hotel booking. Enter the details essential for making the booking. Search for the available options. Pick the flight or hotel that best suits your travel plan. Make the booking. Give the coupon code CTAPPAXIS to avail the Cleartrip mobile app offer. The cashback amount will be deducted from the billing amount. Cashback of Rs.1000 is provided on roundtrip international flights and international and domestic hotel bookings. Cashback of Rs.500 is provided on domestic flight bookings. Choose to make payment using Axis bank or credit card. Reservations made using Cleartrip customer care services and IVR/phone services are not eligible for the offer. It is valid only on payments made using Axis Bank Credit or Debit Card. Each user can avail the offer only once during the offer period and it cannot be used with other offers on Cleartrip. If the customer cancels the booking the refund amount is calculated by deducting the cashback amount. It is valid only for adults and children bookings. 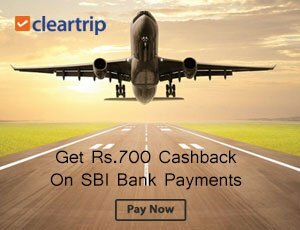 Cleartrip is provides Rs.700 cashback on domestic flight bookings for SBI customers. The minimum booking value has to be Rs.5000 to avail the offer.Login to your Cleartrip account. Choose to make a domestic flight booking. Choose to make round trip or one-way booking. Enter the required details such as the departure and destination locations, travel dates and the number of adults, children, and the infants traveling. Click on the search flights button to obtain the list of available flights. Pick the flight that best suits your itinerary. Make the booking. Enter the coupon code CT7000SBI. Choose to make payment using your SBI card. The cashback amount of 700 will be deducted from the total booking amount. Make the payment. The offer is valid only on domestic flight bookings. Payments made through SBI card are only eligible to receive the cashback. The maximum amount of cashback that can be obtained is limited to Rs.700. The minimum domestic flight booking value has to be Rs.5000. 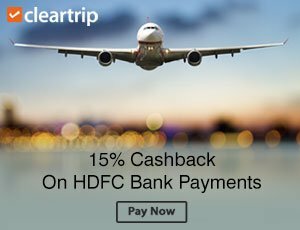 This interesting Cleartrip bank offer is providing 15% cashback of on flight or hotel reservations for HDFC PayZappusers. Download the Cleartrip application. Register at the Cleartrip website. Open the application. Choose to make the flight or hotel booking. Enter the details required for making the booking. Search for the available options. Choose the flight or hotel that suits your travel itinerary. No Cleartrip valid coupon code is required to get the cashback. Choose to make payment through HDFC PayZapp wallet that is safe and secure to use. Link your HDFC credit or debit card to PayZapp and make payments in a single click. The maximum amount of cashback that can be obtained by a customer in one month is limited to Rs.750. Each user can avail this only once. It cannot be used with other HDFC or Cleartrip cashback offers. If the customer cancels the booking, the refund will be made after deducting the cashback amount. It is valid only for adults and children bookings and infant bookings are not eligible. Cleartrip in collaboration with Kotak Bank is offering Rs.1000 cashback on the domestic or international flight and hotel reservations made using Cleartrip Mobile application.Open the Cleartrip application. Choose to make hotel or flight booking. Enter the details required to make the reservation. Pick the option that best suits the requirement and make the booking. Enter the Cleartrip app discount code CTAPPKOTAK. Choose to make payment using Kotak Mahindra Bank credit or debit card. The cashback amount is calculated depending on the reservation made. Cashback of Rs.500 is provided on domestic roundtrip flights. Cashback of Rs.1000 is provided on international roundtrip flights, domestic hotels and international bookings worth Rs.5000 or more. The cashback amount will be deducted from the billing amount instantly. Make the payment. Customers can choose the travel date of their choice. It is valid only on transactions made using Kotak Mahindra Corporate Credit card, Kotak B2B, and Kotak Travel credit cards. It is valid only on Cleartrip mobile application. Each user can avail it only once during the offer period. If the customer cancels the reservation, the entire cashback amount will also be canceled. It is valid only on adult and child reservations and it cannot be used with other offers on Cleartrip.com. Cleartrip reserves the right to change the terms and conditions anytime without any notice. Pros: Cleartrip Giving Multiple Payment Options to avail Cashback and Discounts. Cleartrip services include domestic and international flight and hotel booking services, domestic and international holiday packages, and providing domestic train and bus reservations. You can find cleartrip dialy deals and offers here. It partners with approximately 15,000 hotels worldwide making it easy for the customers to find the hotel of their choice at different places. It is estimated to handle about 15,000 air transactions and 2,000 hotel bookings everyday through its online portal. Apart from the web portal, Cleartrip also operates a separate portal for Business and Corporate companies. Cleartrip Business provides travel booking services for medium and small organizations. 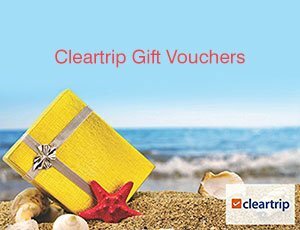 Cleartrip Gift card is the best gift for your loved one on any occasion especially if they are interested in traveling. Cleartrip provides different gift cards to best suit the occasion – anniversary, birthday, wedding, corporate and vacation. The special Cleartrip voucher can be redeemed for making hotel, flight or weekend getaways booking. The gift card can be purchased directly from the website or from Amazon. Purchasing and sending the e-gift card is very easy. Just place the order for the gift card of your choice, make the payment and the gift card will be instantly sent to the recipient’s address or to the recipient’s email address that is mentioned at the time of purchase. The recipient can redeem the gift card very easily by providing the 16 digit Cleartrip gift code and the 6 digit pin before making the payment. If you have multiple gift cards, about 3 gift cards can be used per transaction. The gift cards are valid for a period of 6-12 months from the date of receiving the gift card. Cleartrip gift cards are not valid on train or bus bookings. The balance amount left over after using the gift card can be used for later transactions at Cleartrip. If the customer cancels the booking made using the gift card, a separate gift card with the refund amount will be created and sent to the customer. If the customer loses the gift card, neither a new card is issued nor is the balance amount reimbursed. Misuse of Gift card causes cancellation of the booking. The GoAir sale of Cleartrip is offering very low airfares starting at Rs.601.The scheme is provided on first come first serve basis. The discount is applicable only on one-way fares. The fares displayed on the site are discounted rates and no coupon code is required to avail the discount. This is valid for all bookings. This cannot be clubbed with other schemes. Group bookings are not eligible scheme. Cleartrip is offering an instant discount of Rs.1200 on domestic round trip flight bookings for HSBC Bank customers. This fantastic offer is valid for bookings made on Friday. Open your Cleartrip account. Choose to make a domestic round trip flight booking. Enter the details such as departure and destination cities, travel date, the date of the return journey, and the number of adults, children and infants traveling. Click on the search flights button to obtain the list of available options. Pick the flight of your choice. Make the booking. Give the Cleartrip promo code for domestic flights CTHSBCFRIDAY to avail the discount. The discount will be applied on the booking amount. Make the payment using your HSBC credit or debit card.Discount of Rs.1200 is provided on bookings made using Cleartrip mobile app and discount of Rs.1000 is provided for bookings made using the desktop application. Cleartrip is the online travel company started by Matthew Spacie, Hrush Bhatt & Stuart Crighton in the year 2006. The company provides domestic and international hotel, flight reservations and holiday packages. It also provides domestic rail and bus booking services. The best part of Cleartrip services is customers can avail all the services at low price. Cleartrip coupons and Cleartrip offers help save on the travel reservations. Cleartrip mobile application helps customers to make their reservations on the go. It has separate applications for Windows phone, iOS, and desktop users. The easy to use mobile application is loaded with all features associated with the desktop. The Cleartrip Business enables travel agents to make group bookings with Cleartrip and get their commission. The company has won awards for offering best services through desktop and mobile applications. Check here to know more about Cleartrip coupons, discounts, and cashback offers. Cleartrip, the online travel booking application was launched in the year 2006 by Matthew Spacie, Hrush Bhatt & Stuart Crighton. The company has three headquarters in India and one in the Middle East. Vast experience of the founders in eCommerce and travel industry has made the company the best in the industry within a short period of its beginning. The application was launched with a single mission of providing comprehensive travel services to users. The Cleartrip mobile app includes all the services available in the web portal making it easy for the customers to manage their travel planning on the go using their smartphone. Cleartrip Android app, Cleartrip iOS app and the Cleartrip Windows phone app can be downloaded for free from Google play store or App store. Nice Collection Of Coupons. I Got Rs.3000/- On Hotel Booking Using RELAXOFF Coupon Code. The voice of rattlnaoiiy! Good to hear from you.